As an educator, JoAnn Laskin groomed many a child for bright futures. As a mother, JoAnn Laskin saw her son, Jonathan, die from the ravages of osteosarcoma (at the age of 17). While Jonathan was undergoing treatment, mother and son collaborated on a stained glass light which was to hang over their billiard table. And while Jonathan is no longer here, JoAnn’s art work has never ceased. 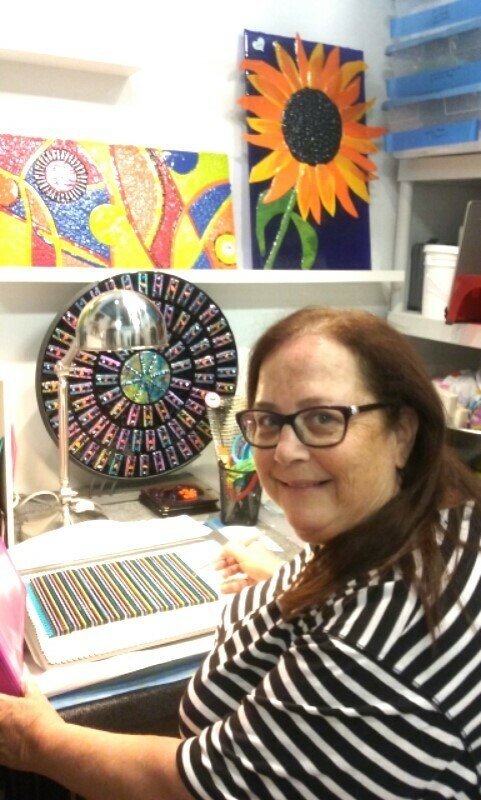 A member of the L/Mercado Studio Collective (meetup.com/Hollywood-fl-art) JoAnn’s artwork is still very tangibly connected with her son, as 50% of all sales are donated to fund research at the Sylvester Cancer Center. And while this wonderful artist ought not be defined by the death of her son, her giving nature is indefatigable. After the recent mass shooting at an Orlando Nightclub, JoAnn donated a piece of art to oneorlando.org. The piece sold for $1,500 with all proceeds going to the families of the victims! We all can learn something from JoAnn’s blessed nature but you can also learn from JoAnn the artist. Log onto www.lmercadostudios.com and check out the schedule of classes. Or just drop in (2000 Harrison St, Hollywood) and meet the artist in person.